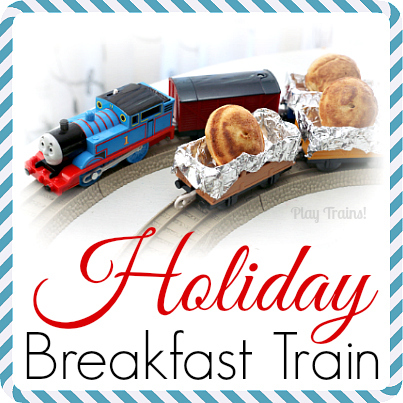 Welcome to Christmas Play Days! 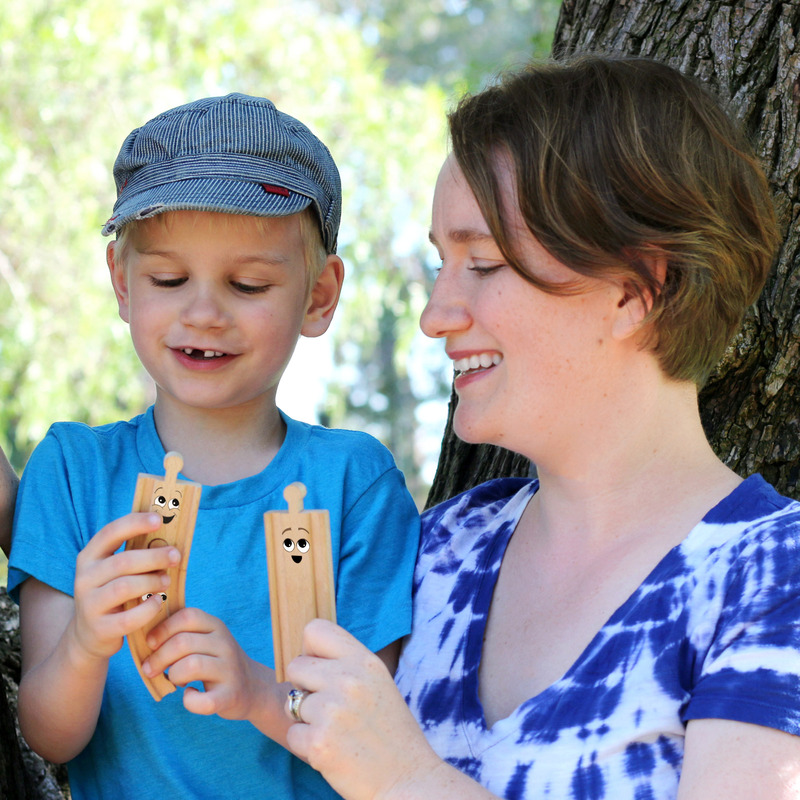 Once again, I’m teaming up with some of my favorite creative women — Shaunna from Fantastic Fun and Learning, Rachael from Nothing if Not Intentional, Chelsey from Buggy and Buddy, Mary Catherine from Fun-a-Day!, and Ann from My Nearest and Dearest — to share fun ideas for open-ended seasonal play. 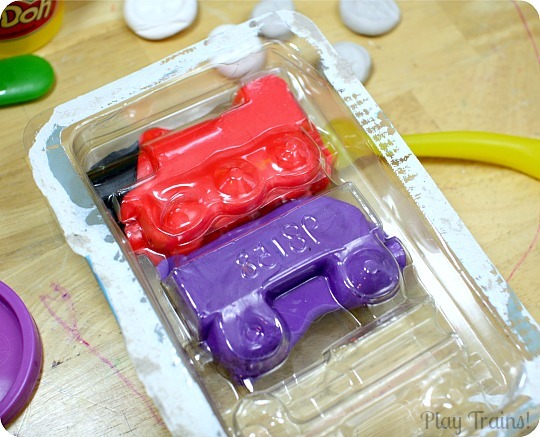 My first activity is a great way to give recycled toy packaging a new life after holiday or birthday presents have been unwrapped: turn it into play dough molds! 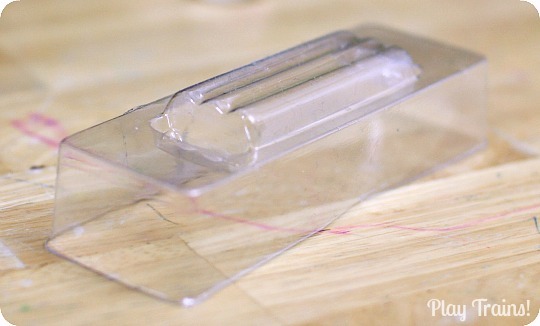 You could do this with any plastic toy packaging molded into an interesting shape. 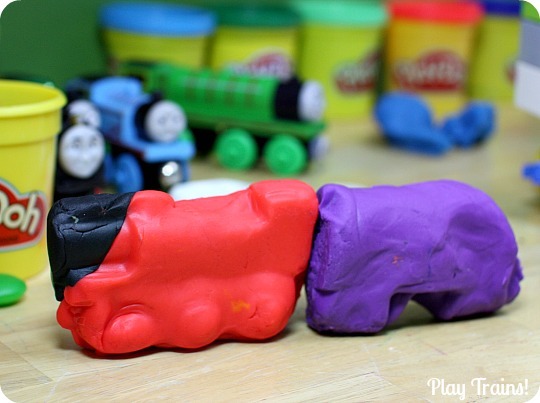 But this is Play Trains!, so we’ll be making play dough trains with ours. 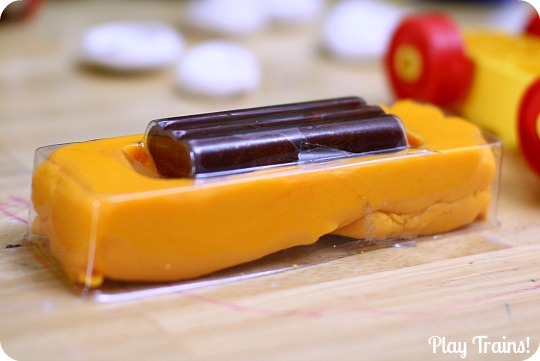 This is a continuation of our DIY Play Dough Train Making Set, where we used Lego Duplo wheel bases to make our play dough trains roll. 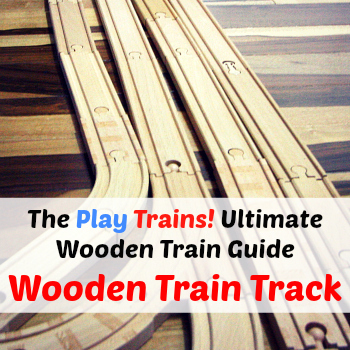 (If you’re in need of Duplo car bases, take a look at this Lego Duplo Number Train set. 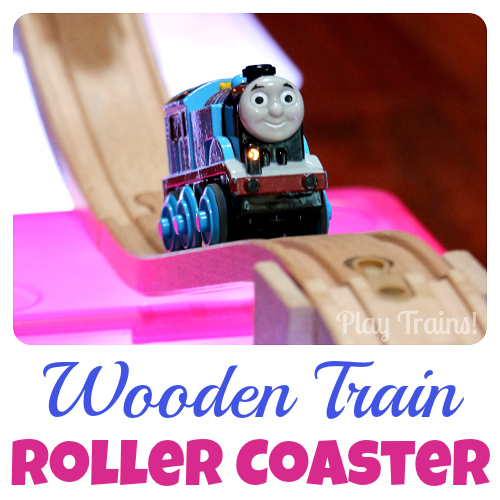 It comes with four of them for a much more reasonable price than I paid to get enough cars to make a proper train a few years ago. Plus, it’s already a train!) However, you don’t have to use the wheel bases; in fact, my second example doesn’t use them at all. 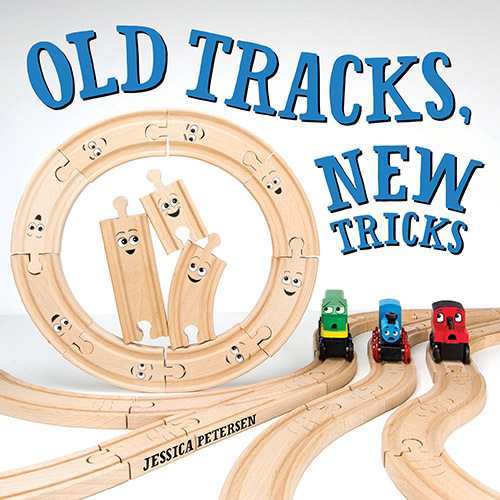 The next time we made play dough trains, I got out a couple of pieces of packaging that had come with wooden trains we’d gotten in the past. 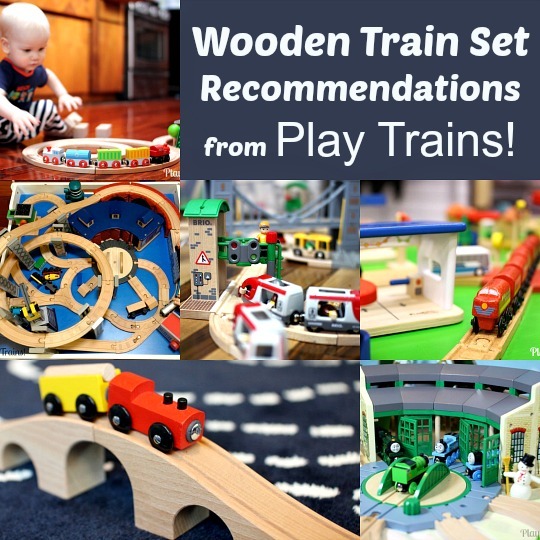 This first one came on an inexpensive Circo freight car from Target. 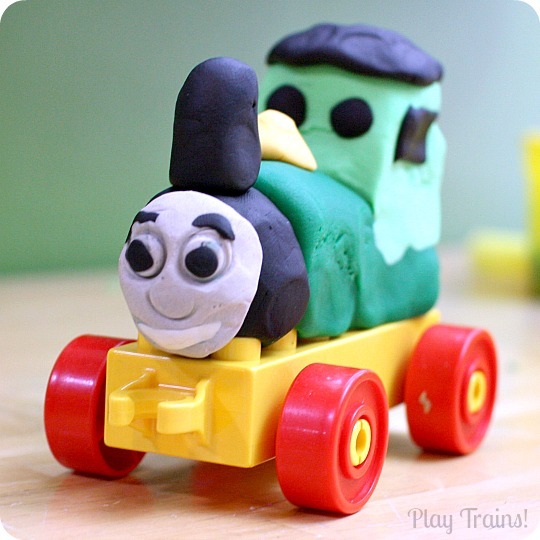 It was easy enough to press the play dough into the shape of the freight car and its freight. Then we pushed it down on top of a Duplo wheel base. 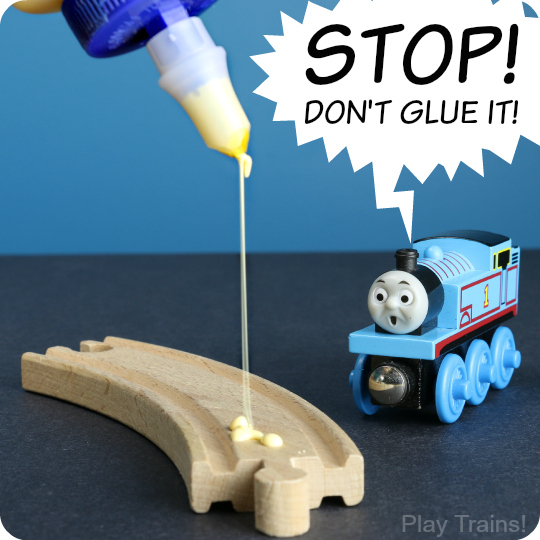 Then we pulled the plastic off, and look, it’s a freight car! I also had this piece of packaging from an older set of Thomas trains we got last year at a train show. Because it was molded to the shape of the whole engines and freight car, we made the wheels with the mold instead of adding a Duplo wheel base. 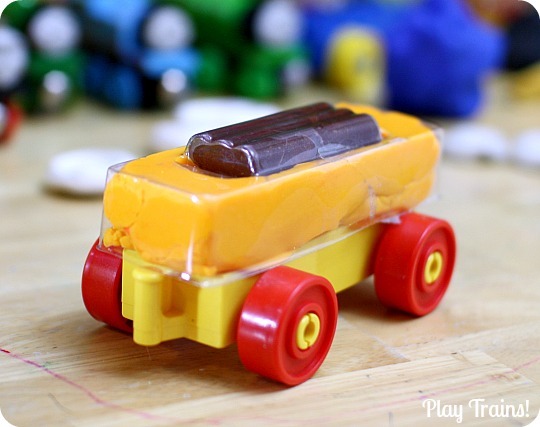 The cool thing about this packaging was that there were two pieces of plastic, both molded to the shape of the toys, so we could press the play dough between them and get a two-sided play dough train. However, because the “mold” wasn’t a tight fit, it took some extra play dough to account for it squishing out a bit in every direction. 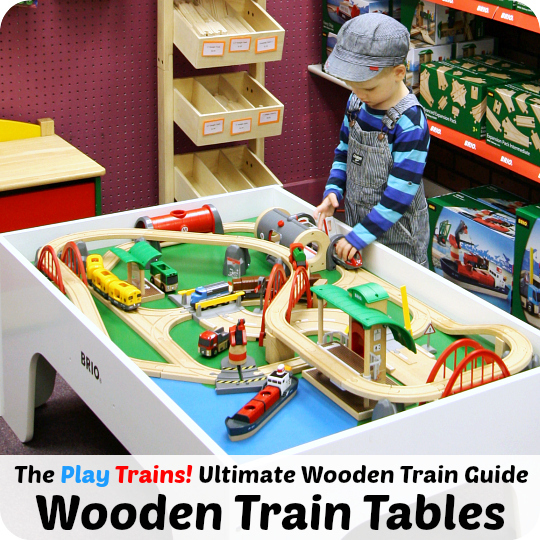 The Little Engineer loved the train and its freight car that came out of this mold. He decided it was Ivo Hugh, a bright red Thomas & Friends engine he only knows from seeing its circus train set in Thomas catalogs. He came up with a whole story about Ivo Hugh and a boulder (also made of play dough) where Ivo Hugh was afraid of the boulder and then decided to be brave. I really wish I had remembered to write that one down! 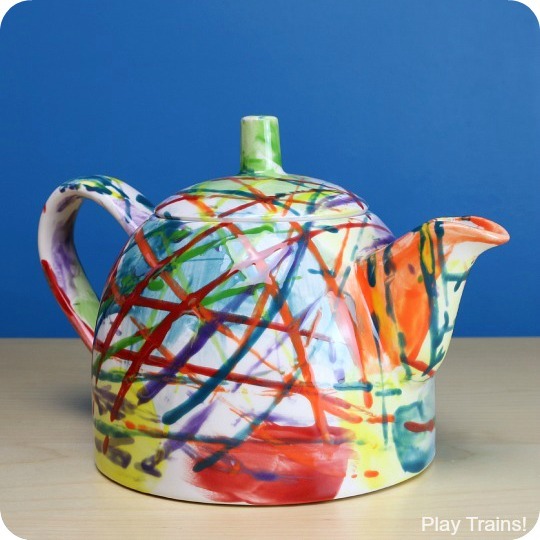 You as your child is unwrapping their toys this Christmas (or on their next birthday or any other gift-giving holiday or occasion), keep your eye out for potential play dough molds. I’d love to see what you come up with! 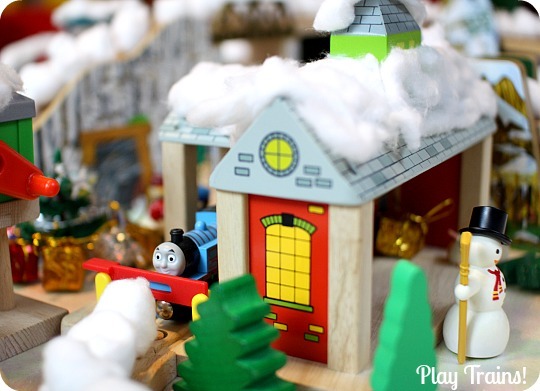 Christmas Pretend Play – Wrapping Presents by Fun-A-Day! 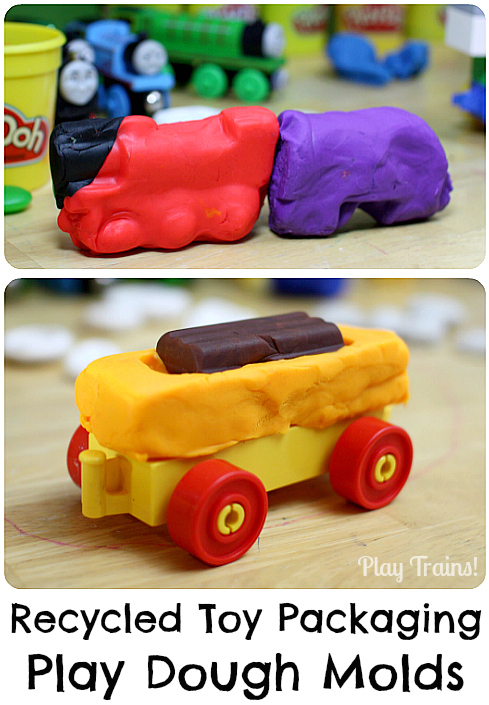 And for more play dough train fun, don’t miss our DIY Play Dough Train Set! This is such a smart idea, Jessica! 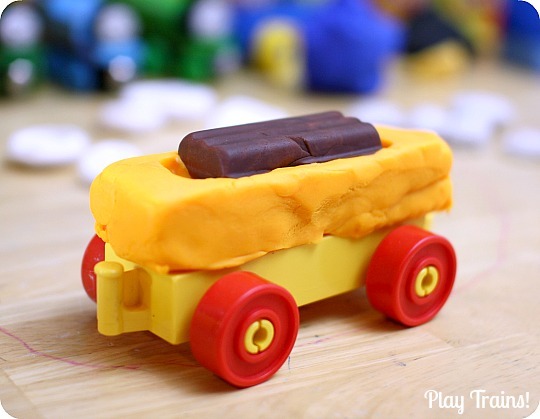 I never would have thought to re-use packaging for playdough molds. I’ll definitely be hanging on to whatever I can re-use after Christmas this year. Brilliant! I hate just throwing away all that thick packaging, but I never know what to do with it instead!